The Eaton 5S UPS provides cost effective line interactive backup power and automatic voltage regulation (AVR) for small and medium businesses. Suited for workstations, desktop PCs, telephone equipment, this product also brings internet and Ethernet protection With its 4 IEC outlets ( 4 with battery backup and surge protection and 4 with surge protection), It can be placed as a standalone tower or under a computer monitor and its slim line design saves space. Furthermore, the 5S possesses an audible alarm to warn you when there is a power problem. 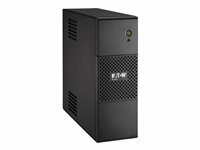 The Eaton 5S UPS provides cost effective line interactive backup power and automatic voltage regulation (AVR) for small and medium businesses. Suited for workstations, desktop PCs, telephone equipment, this product also brings internet and Ethernet protection With its 4 IEC outlets ( 4 with battery backup and surge protection and 4 with lightning protection), It can be placed as a standalone tower or under a computer monitor and its slim line design saves space. Furthermore, the 5S possesses an audible alarm to warn you when there is a power problem.